Very useful computers, calculators, and information for film photography in these. Here is a 95 page Nebro catalogue for 1962 in excellent condition. 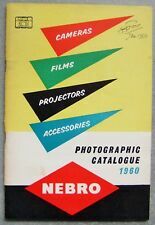 Here is a 63 page Nebro catalogue for 1960 in excellent condition. 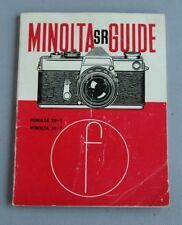 Here is an original 96 page Photomart catalogue from 1964 in very good condition. A second edition, dated March 1965, covering the SR-1 and SR-7 models. Genuine original Mamiya 645AFD Original Instruction Manual manual, softcover, English language, 102 pages, printed in Japan on recycled paper. In very good condition, pink highlighter mark on inside back cover does not obstruct any info. The Bolsey Guide. Published by Greenberg in 1951. All of the books we list are originals, (not photocopies), and range in condition from good usable condition to like new. Each is graded “Excellent”, Excellent Minus”, and “Average”, depending upon condition (see below). All of the owner’s manuals we list are originals, (not photocopies), and range in condition from good usable condition to like new. Each is graded “Excellent”, Excellent Minus”, and “Average”, depending upon condition (see below). This is the 39th edition from 1980. THE LENS BOOK. CHOOSING & USING LENSES FOR YOUR SLR. Here is a 1994 160 page book by Roger Hicks & Frances Schultz on choosing and using lenses for your SLR. It is in very good condition. The back has the stamp of Karl Heitz, New York importer. Hardback and 472 pages including quite a lot of black and white pictures. Also included is T20 flash instructions. Good condition, minor signs of use. Lovely booklet detailing the history of Leica. Many photographs. I Am Not a Robot. This is the 5th edition from 1965. Mamiya C3 Professional Users Manual. Here is a 1991 189 page soft bound on the Olympus modern classics, including OM-1, OM-2, OM-10 etc. It is in very good condition. Bedienungsanleitung der Linhof Aero Techniks 45 EL und dem gesamten System. Für den Sammler und Anwender eine Möglichkeit der besten Information. Sprache: deutsch/english. Sie erhalten eine Rechnung. (#152-7761) from 1981. Model: Master Photoguide. Make: Kodak. Year manufactured: 1981. I am easily accessible and do my best to respond as quickly as possible. Any defects or excessive wear will be disclosed and photographed for your viewing. Here are 3 original instruction manuals. One is for the Konica autoreflex TC, one is for the Ricoh KR-10, and one is for the Ricoh KR-10 super. The Konica manual shows a little more wear than the other 2. Semflex Standard Semi-Otomatic 3,5 B.Mode d'emploi Français.Appareil Photo 6x6. Mode d'emploi Appareil Reflex Bi-Objectifs. Semflex Semi-Otomatic 3,5 B.16 pages.Signes d'usage mais complet. Sem.16 pages. 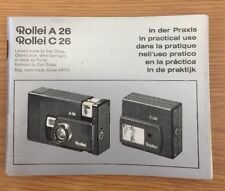 Yashica TL Electro-X ITS original printed instruction manual in excellent condition. English edition. Nikon Coolpix S3 3mit Software ViewNX2. oder Vorauskasse möglich. Sie erhalten eine Rechnung. The Johnson way to better photography - booklet from Coleman & De Carle Ltd, Photographic Chemists, Norwich. 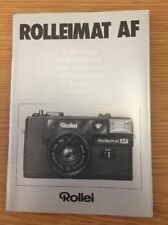 The Kodak Magazine For Amateur Photographers was a periodical published by Kodak Ltd. and available to the general public in the UK through Kodak dealers. The edition for sale dates from March 1932 and is in good condition with just a small amount of wear on the edges (see photos). The content of the books is still very readable. Here is a scarce original illustrated catalogue for the 1955 autumn pictorial exhibition of the Royal Photographic Society. It is in excellent condition. An original 1950 Ensign Photographic Catalouge. - Have not seen one before, great piece of Photographic history. Interior good and clean. Must have for your collection. 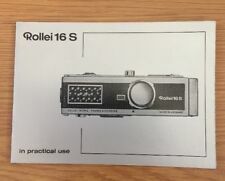 Polaroid land camera instruction manual. In good condition. In great condition, with no apparent marks of use, no stains, Third Edition, First Printing/ 1966. The book has missing front/rear cover - and the rest of the contents has been "attached" together. May not look pretty - but the contents itself is full of good information (such as Nikon F, Nikkormat Ft, lenses, general photography). The Photography Book (Hardcover) full size, 1997. In good condition with normal age related wear. Antique Photo Camera Catalog 1903 Anthony and Scovill Co. NYC VERY RARE ADV. Vintage 3 Kodak "How-To" Photography Guides 1920's Excellent Condition RARE!